The top part of this device houses the main lantern lights. Pulling it out will activate and expose the lights. To adjust brightness, you simply pull out the top. The more it's pulled out - the more the lights are exposed, and therefore the brighter it gets. Swiftrans lantern must be a good friend, No matter where you are, it can solve many problems for you, Lighting is the main usage. Besides, base can be help you with something magnetic, even car fixing. In a word, not only can it be use outdoor such as camping, riding and fishing, even for some emergencies, but also perfect helper at home. 【Ultra Bright】Latest technology COB which is brightly illuminate 360 degrees - enough to light a tent, caravan, boat, garage or shed with ease. And holds a longer life. 【Magnetic base】Built-in magnetic adsorption on any iron, practical while searching in the dark and practical for emergency. Even better while repairing your car. 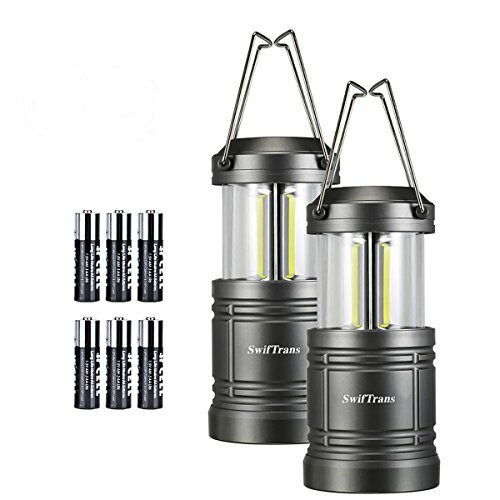 【Super Longer Battery Life】This lantern package including 6 AA batteries, 3 AA for each one, and it provides 12 hours brightness, at the last 4 hours, it will adjust automatically to dimmer brightness for low energy consumption. 【Portable and Convenient】It must be a good partner for camping or other outdoor activities because its lightweight. If you have any questions about this product by swiftrans, contact us by completing and submitting the form below. If you are looking for a specif part number, please include it with your message.